Bright blue skies over Kinston Saturday afternoon allowed clouds of smoke to be seen for miles around as the Kinston Department of Fire and Rescue spent the afternoon training. The large white two-story house at the corner of Bright Street and Independence Street had been transferred to city ownership, according to Capt. William Barss, and was slated to be demolished. “Instead of coming in with more expense … to demolish it while it’s still standing, we can controlled burn it … and it’s less mess to clean up and less cost to the city,” he said. 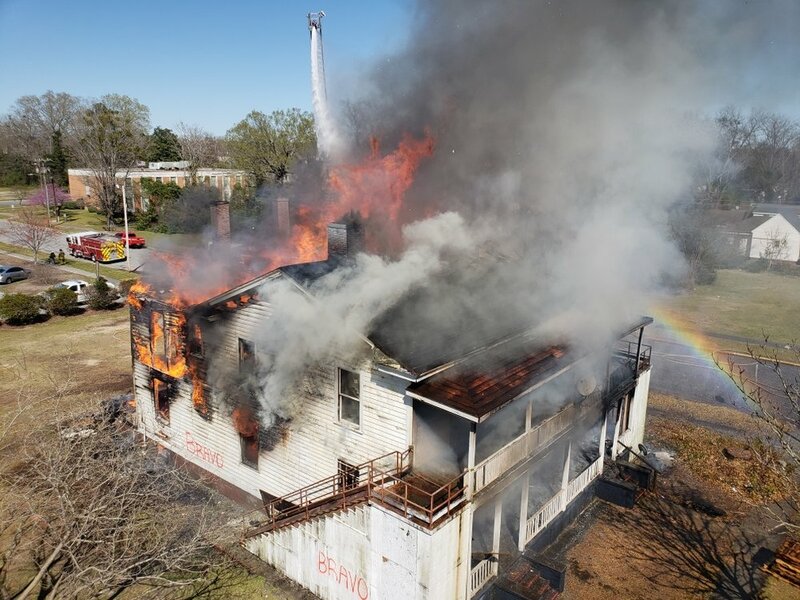 Members of the department worked in teams throughout the afternoon so they could get experience fighting a structure fire outside a typical training environment. “There’s nothing better than real-life active fire-fighting in a structure,” Barss said. Department chief Damien Locklear said training in acquired structures is vital for the department, especially for newer members, including those who were sworn into the department this week. The chief did not just observe the training from outside; he spent much of the afternoon inside, observing the crews as they came inside to attack the fire. After setting and then extinguishing a series of smaller blazes, the department then went into defensive mode as the final blaze was set to burn the house to the ground. Blustery wind conditions made controlling the flames more difficult, but most of the structure was consumed by the end of the afternoon. Capt. T.J. Swinson said the windy conditions throughout the afternoon were challenging, but they made the exercise more valuable from a training standpoint. 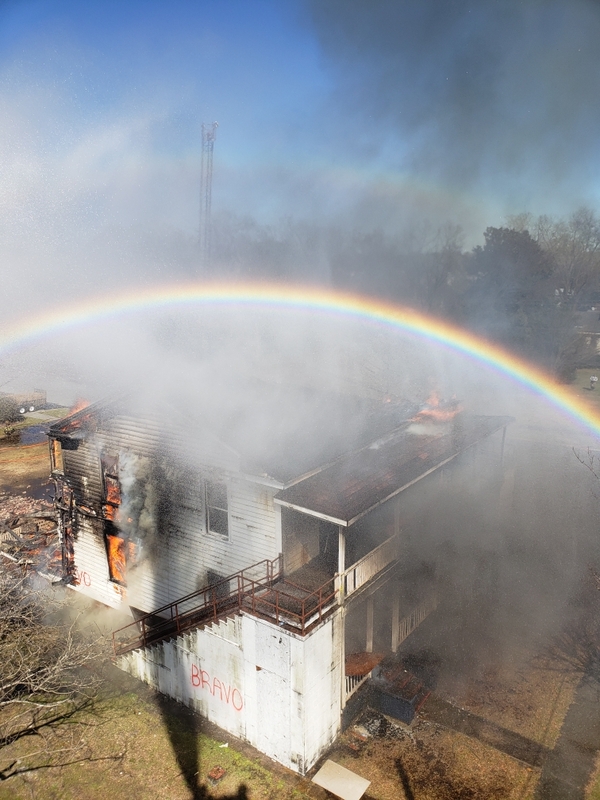 Overall, Locklear said, the training was a success, and the members of the department worked well together as they fulfilled the double purpose of improving their skills and saving the city the cost of a demolition crew.